Providing gifted students with a rigorous curriculum and enriched opportunities to challenge intellect, inspire curiosity, and deepen self-discovery. Network with other honors students and faculty at regular events such as the weekly “Honors Happy Hour” in Common Grounds Coffeehouse for chess and other fun. 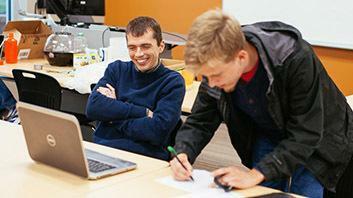 Collaborate with faculty members on interdisciplinary research. Explore new ways to think about and share your faith journey amidst biblical understandings of the wider Anabaptist and Christian traditions. Contribute to the broader EMU community in leadership capacities. Earn an honors scholarship as a first-year student. Known as Honors Scholars, these students have the option of completing the honors program. SCHOLARSHIPS: Prospective honors students can compete for the full-tuition Yoder scholarship. All first-year students accepted to the honors program receive half-tuition scholarships (a cumulative 3.5 GPA is required to maintain this). ACADEMIC MINOR: Honors seminars, other coursework, research opportunities and foreign language study. HONORS GATHERING: Weekly meetings of students and faculty, and monthly student-planned events to explore interesting topics and meet professionals. MENTORING: Honors program faculty and staff, as well as older honors students, nurture and mentor each other. Honors scholarship recipients receive $82,000 ($20,500 per year over four years) in scholarships for high academic achievement. Full tuition scholarships are available to first-year student applicants who compete in the Yoder Scholars competition during honors weekend. The first-year honors course “Ruling Ideas” serves as the gateway to the honors curriculum. In subsequent years, any EMU student may opt to join or remain in the program by maintaining a 3.6 GPA and engaging in the full honors curriculum. 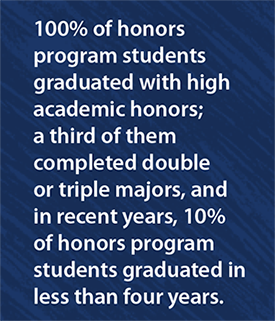 Honors scholarship recipients maintain their honors scholarships as long as they maintain a 3.0 GPA. Honors classes are taught by EMU’s most accomplished faculty and invite collaboration and innovation, pulling professors and students together in deep exploration of a topic. The curriculum functions as an academic minor that includes course work, experiential components, foreign language study, and a capstone project. Weekly honors gatherings informally bring together honors students and faculty for conversation and mentoring. Monthly events are planned by honors students and provide an outlet for exploring interesting topics, expanding curiosity, and having fun. 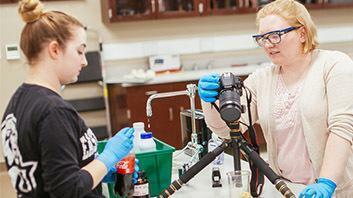 Students are nurtured via mentoring relationships with fellow honors students and the EMU honors faculty and staff. Honors scholarships are granted to first-year students at time of acceptance into EMU; eligibility is based on a sliding scale that takes high school GPA and standardized test scores (SAT or ACT) into account. To determine your eligibility for an honors scholarship, use the EMU Cost of Attendance Estimator. Full engagement in the honors program (programming in addition to the scholarship) is available to those who maintain a GPA of 3.6 and opt into the program their sophomore year. In the months before the annual honors weekend in February, students eligible for the honors scholarship may compete to be a Yoder Scholar. The Yoder Scholars competition allows students eligible for the honors scholarship to compete for full-tuition scholarships, EMU’s highest academic award. 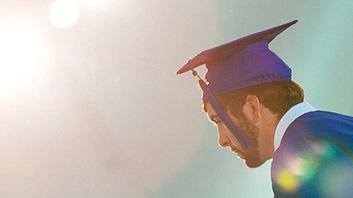 To compete, students must meet the honors qualifications and apply to EMU. Yoder Scholars will be chosen based on essay question responses, interviews and interaction during the honors weekend.